The Pembina field is located approximately 120 km southwest of Edmonton and extends over an area of 2,070 km2. 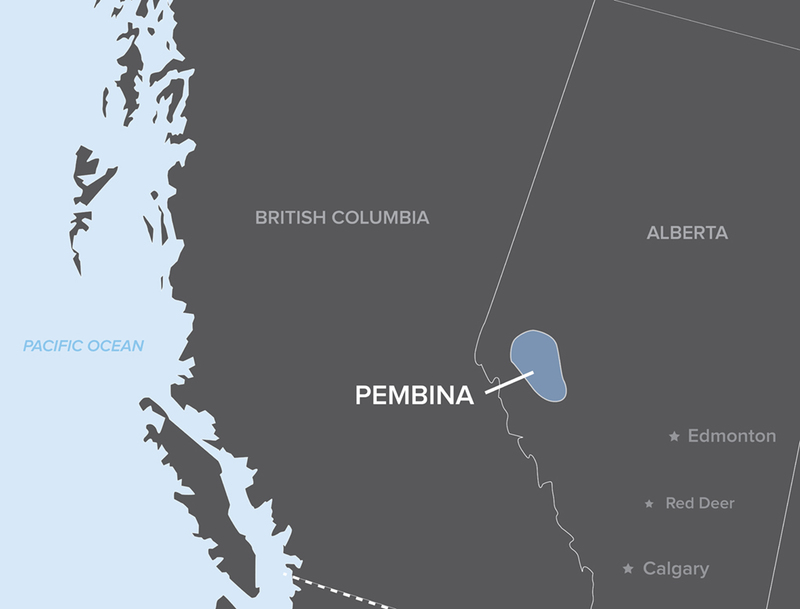 Discovered in 1953, Pembina is the largest conventional onshore oil field in Canada, containing an estimated 7.4-7.8 billion barrels of original oil in place. The field produces light gravity crude from the tight sandstone Cardium formation. Approximately 1.2-1.4 billion barrels of oil (16-18%) have been recovered from the Pembina reservoir, but new technology is required to extract the remaining reserves. A junior operator took a chance on an area of the Pembina previously exploited by vertical wells, which they felt had bypassed potential oil production from tight rock zones. To capitalize on the unexploited reserves, they turned to horizontal open hole wells and multi-stage fracturing, which they knew had been successfully utilized by large operators in the area and in similar resource plays in Western Canada. Working together with a second operator, a joint-venture discovery well was drilled and completed using a 7-stage StackFRAC® system. The system was installed to a measured depth of 2,455 m and a true vertical depth of 1,330 m to target the Cardium formation. All seven fracture stimulation stages were completed in one day. Initial production from the well came on at over 250 bbl/d of light oil with no water cut. This well is away from areas where secondary waterflooding has been used to maintain reservoir pressure, so there is minimal risk of fracturing into water. A second well was completed with a 9-stage StackFRAC system and performed similar to the first well. Production rates were in excess of 250 bbl/d with minor solution gas and no water. Packers Plus is the innovator of open hole multi-stage fracturing systems, providing field-proven and cost effective methods for completing horizontal wells with superior production results in numerous formations around the world, including mature reservoirs.